Pests Professionals Secret Solution Exposed! We pride ourselves in infusing wellness into our customers lives. One way do this is being completely honest with our customers. So you know we are truly dedicated in helping you get rid of your bed bug infestation. You will be receiving a complimentary sample with your order. No charge at all! It's recommended to use the sample first, if it doesn't work. No worries, keep it. You are eligible for a refund on your purchase! Empty containers are not eligible for a refund. A customer purchased a 32oz Bug Spray, the customer has used roughly 50% or half of the product. No problem, send back the product and the customer is eligible for up to 50% of the product upon inspection and review. It is much like the following: If you order a hamburger at a restaurant, eat the entire hamburger and then ask for a refund and just give him back the wrapper the burger was packaged in. You can imagine the managers surprise of the request. 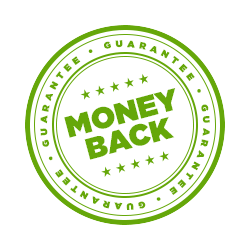 Our customers tend to be very honest people and understand that returns with no liquid left in the product are not within the spirit of the guarantee and cannot be honored. This is why we send you the free sample, so you don't have to worry. This special is NOT going to be available forever. 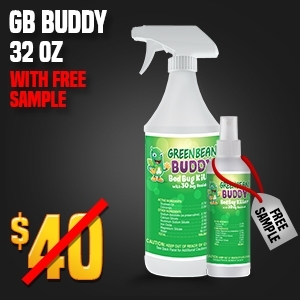 Think about it, You will be receiving a complimentary sample of Green Bean Buddy valued at $20 entirely FREE! Once these kits are gone, so are the order links and the special. 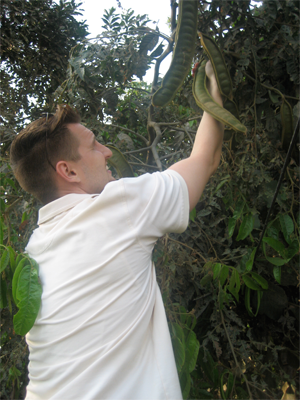 Green Bean Buddy has been a Top Green Product with large pest control companies, hotels and health facilities. Since it’s public release we have already received great feedback from our customers in helping them get rid of their bed bug problem. Don't worry in addition to the complimentary sample I will be sending. 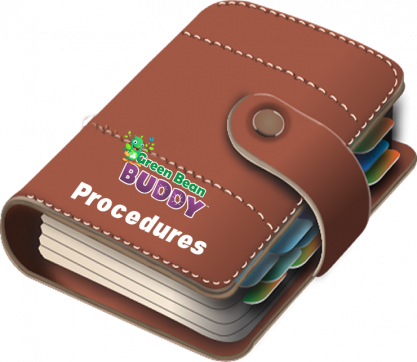 You will also be receiving our official green bean buddy inspection procedures booklet at no additional charge. So not only will you get rid of your bed bugs, I want to make sure you know how to inspect for bed bugs and the where the source of the problem came from. This way you don't have any bed bug rashes, bites, and any future infestation issues later. And of course... I want to make sure our relationship starts off in right direction. It's obvious, Bed Bugs infestations keep getting worse the longer left untreated. In fact, bed bugs will migrate thru electrical outlets, walls, linens, and baggage becoming a dangerous pest outbreak. Next, you will be told to throw away all your valuables, your clothes, furniture, bedding, etc. Then after all this, you would be asked to politely evacuate and you or a company would use toxic pesticides having you feel homeless for at least 4 weeks. Our Green Bean Buddies get dozens of calls about the painful bed bug bites which happen during the middle of the night. The infestation continues to get larger and larger each night, thus increasing the bites & interrupting your sleep patterns. After a bed bug infestation, you will most likely notice skin irritations, bed bug rashes, and bed bug bites making you feel self conscious when in public. Even worse, restless nights and insomnia which now affects your personal life, causing anxiousness and nervousness. If you ever had a bed bug treatment done. The product they are using is most likely Green Bean Buddy. Now after renewing our license agreements. 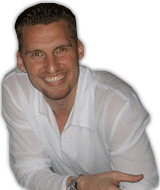 We are able to serve not only our loyal past clients. We setup a clause specifically to offer the product to the public and you. What About Using A Professional? We have a huge respect for pest professionals and work very closely with well know companies, especially after the EPA has warned about select hazardous chemicals in pest control projects. We also love recommending our pest control companies to any of our customers who choose to try a professional. But the fact is… certain folks do not wish to tent up their home, place of business and lay deadly chemicals (in the vicinity of their animals or family) or have to evacuate in hopes to get rid of bed bugs. Most folks come to us because they don’t wish to pay $500 to $1,000 for a thorough bed bug treatment. Keep in mind, this fee does not include the repeat service that will be required after completing the inspection. We love pest control professionals and our Green Bean Buddy was privately available to these large pest control companies. These guys loved it and were making fortunes using it, and still are today. Just up until now, you could not get access to this non pesticide professional grade bed bug solution due to private licensing agreements we agreed upon. Well, luckily for you, whether a bed bug professional, property owner or consumer we renewed our license agreements and it’s now available to both our private clients as well as you today, but for a limited time. Green Bean Buddy is super-easy to use. Just aim and spray… then allow to settle. Spray on carpets, walls, linens, and bedding Even spray to create a barrier around windows and doorways to prevent new infestations. 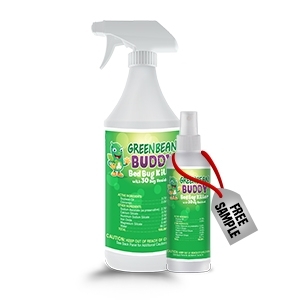 Green Bean Buddy is a huge success in the pest control industry. Quickly the formula began killing bed bugs and juvenile’s. It was a bumpy 6 hour flight from sunny Miami, Florida to an old country, rich in culture and knowledge of the earth’s natural healing properties. Finally touching down… I hit my first destination. The unique city of Lima, Peru. Although, amazed by the busy city. This was not my final destination. I was set to go deeper… where civilization has forgotten. The Mission: Find unique ingredients to create products to improve health and wellness. In order to learn this historic knowledge of these lost remedies. This involved getting close to the locals… eating, talking, and sharing knowledge. 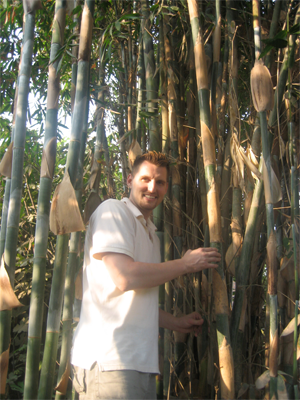 The adventure was “Transforming” and “Enlightening” and was the only way we could of made so effective and natural green products which use no dangerous chemicals or pesticides. After researching and discovering these unique ingredients from around the globe. We bring them to our manufacturing plant and begin working on them in the lab. Our team diligently tests and formulate new ideas to create some of the most unique green alternatives for green cleaning, pest control, health and beauty and other industry solutions. After months of research and production our products are privately offered to our loyal clients who sign lease agreements to be the only companies to use the products for a specific amount of time before being offered to the public. These very well known companies understand the amount of research we put into our product line and see the amazing results. Now that we have renewed the license agreements we still can offer our products to these large companies, but now offer our products to the public, which is why you are seeing the special today. We know the product works, we are so confident you will receive a complimentary sample included in your order which you can select right now below. (a 20 value!) You have nothing to lose! What Are Green Bean Buddy Ingredients? How much Green Bean Buddy do I need? How To Use Green Bean Buddy? When Should I Re-Apply Green Bean Buddy? Green Bean Buddy has a residual of 30 days from our testing. 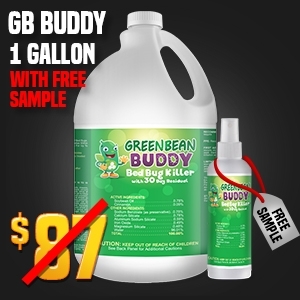 We suggest to re-apply Green Bean Buddy every 7 days to help you get rid of bed bugs entirely. We recommend the following re application method to help you get rid of your bed bug outbreak. You will notice the bed bugs either visually dead or evacuating the residence due to the formulas unique light cinnamon aroma. We have had many clients not only see 100’s of dead bed bugs, but also noticing bed bugs leaving hidden crevices and trying to escape the home. How Long Does It Last Against Bed Bugs? Does It Stain Carpets or Furniture? Can I Use It Around Children or Pets? 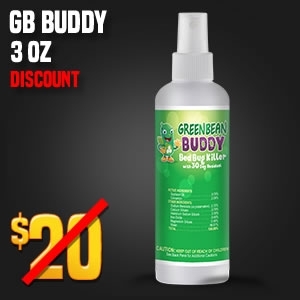 Green Bean Buddy is a product in which many pest professionals, resorts and health facilities are using today. The product was privately used by larger pest control companies until recently. When we have renewed license agreements so the product can be sold to both our long time pest control companies customers as well as publicly to consumers. 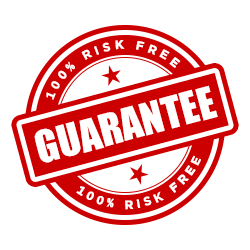 We believe in the product so much, we offer a 30 day no risk guarantee. 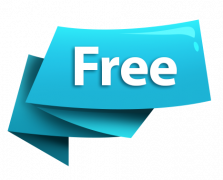 We send you a free sample included in your order to use first. Spray on the bed bugs, see it work yourself. If the product does not kill them. Keep the sample just send back the remaining other product. 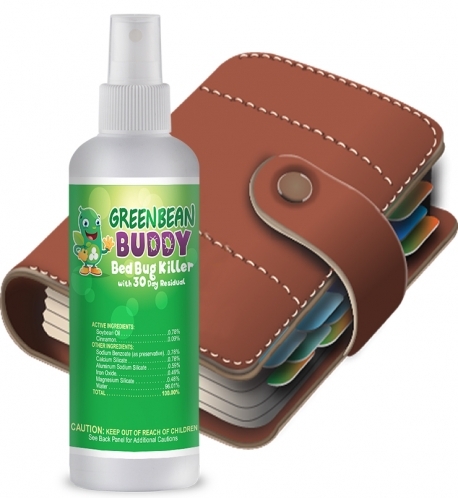 Green Bean Buddy is unique pesticide exempt bed bug spray(under FIFRA Section 25(b)) on the market! 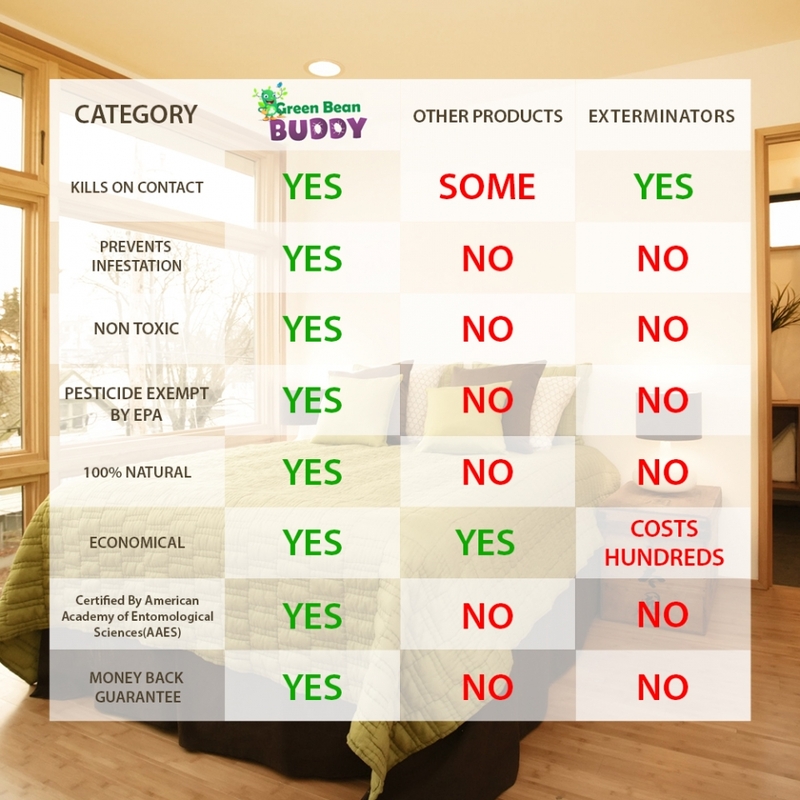 The non pesticide bed bug spray is safe and powerful alternative to kill and prevent bed bugs. The odor is a fresh and natural fragrance of cinnamon. 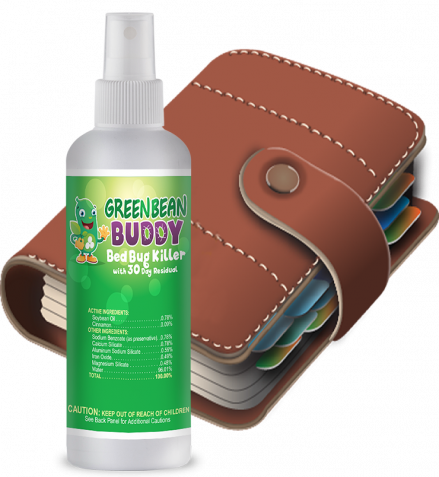 There is no harsh odors or chemicals in Green Bean Buddy. 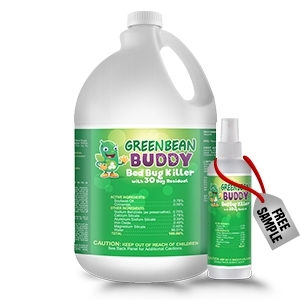 We recommend a 1 Gallon Container per each room you plan on using Green Bean Buddy. This allows you some additional product to maintain and prevent future outbreaks. 1. First, thoroughly clean and air affected areas. 2. Spot treatment to cracks and crevices, baseboards, floorboards, headboards, and walls. 3. Spot treat only areas that may harbor pests. Green Bean Buddy should not be used on water sensitive materials such as silk or Haitian cotton products. Most physicians recommend treating areas where dust mite and bed bug concentrations are highest such as near beds and regularly used furniture. INDOORS: Green Bean Buddy is designed for use on beds, carpets, rugs, stuffed chairs and sofas. Green Bean Buddy has a residual of up to 30 days and should be re-applied to keep future outbreaks from re-occurring. We have had cases of bed bug problems reduced up to 3 months, although each case is different. So it’s safe to say, you should feel confident up to 30 days you will be able to keep bed bugs away and simply re-apply every once a month for future outbreaks. Nope… not at all. We always recommend to spray a small location to test. But the product is a clear solution which has no color or staining capabilities. We recommend Green Bean Buddy not be used on water sensitive materials such as silk or Haitian cotton products. Most physicians recommend treating areas where dust mite and bed bug concentrations are highest such as near beds and regularly used furniture. Absolutely. 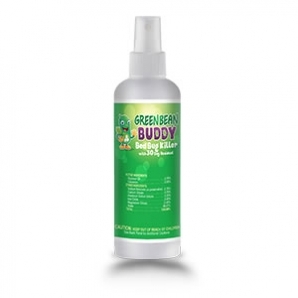 Green Bean Buddy contains no harsh odors and is a non pesticide formula recognized under FIFRA 25(b) by the EPA. It is safe to use indoors and outdoors around children and pets. There is no harsh odors. In fact you will smell a pleasant cinnamon aroma which gives your home or residence a pleasant clean fresh smell. We can guarantee there will be NO PESTICIDE ODOR what-so-ever, as this formula is unique and does not contain any harsh chemicals.